Fortunate Nyakupinda earns a living by selling secondhand clothes from the back of her car. On May Day, Zimbabwe's information minister, Jonathan Moyo, posted a bleak tweet, listing what he described as his country's triple challenge after the economic crash of 2007-2008: "We've workers without work, we've lost the sense of labour value and we lack a strategy to create wealth." Zimbabweans lament that life is tough and everything is expensive in their U.S. dollar-based economy. So how do people get by? In Copacabana, an area of downtown Harare, the capital city, people are eking out a living, literally on the sidewalks. Vendors sell everything you can imagine, from piles of tomatoes and sweet potatoes to long stalks of sugarcane to used clothes and shoes, all laid out by the roadside. Fortunate Nyakupinda parks her car about half a mile away from the hubbub at Copacabana. Her livelihood fills and covers her parked hatchback. She sells used clothing. The first thing that strikes you is her big smile and big laugh. "Yah, I'm earning a living," she says. "We get profit — a little bit profit, yah. So I can pay my rent, even buy food for my kids, and I can even pay five dollars for fuel to juice my car." The 30-year-old mother of two is clearly a born businesswoman. She stacks the neatly-folded shirts and pants at the back of the car, some sitting on a wooden shelf. Jeans and jackets cover the hood and the windscreen. "These shirts are plain for church. These checked, it's for the farmers," she says about her inventory. "And those ones for going to work. Every man can come and buy. Everyone. You can see it's stylish. This one's an African attire — yah!" It's a way to earn money with high unemployment and a stuttering economy, says Nyakupinda. She specializes in men's clothes, because she says women are too fussy and haggle over prices. "They like clothes, but they are stingy," she says and laughs. "They complain too much, and they want discount." A friend encouraged her to get into the used clothes business about two years ago. They travel across the border to Mozambique to buy used clothes by the bale from dealers in the port city of Beira for about $250 per bale. Zimbabwe is landlocked. "Eiiiiiiiiiiiiii, I was inspired by my friend to go. She said, 'Let's go to Mozambique and buy these bales. They are cheap and the clothes they are very strong.'" New clothes are pricey, and many Zimbabweans can't afford them in a country that used to produce quality cotton. "There is no more industry in Zimbabwe," Nyakupinda says. "So if we sell these clothes at a very cheap price, people will come and buy." Zimbabwe jettisoned its currency after the economic crash. Today, the country relies on the U.S. dollar. Nyakupinda says life is expensive, and money for a family just disappears. "Everything in Zimbabwe now is very difficult," she says. "Even to get a dollar ... I must plan." Nyakupinda shies away from talking politics. Asked who's to blame for Zimbabwe's economic problems, she just counts on her fingers what she would get for $10. "How can I use this $10? Three dollar can buy cooking oil. Left with seven dollar. Dollar you can buy bread. Then left with six dollar. A dollar again maybe kids, they want some chips. Now you're left with five dollar. You want bread. You're now left with four dollar. You want fuel for the car. That ten dollar is finished." She says, "Every day, maybe you need $20, every day, so that you can survive in Zimbabwe. You need sugar for the tea, you need mealie meal. Ah, it's hard." Nyakupinda's focus is on boosting her business. "We are many here, so the competition is very high now," she says. "I'm doing good business, but it's now very tough. Yeah, I'm feeling proud of myself." As we're chatting, business is brisk. 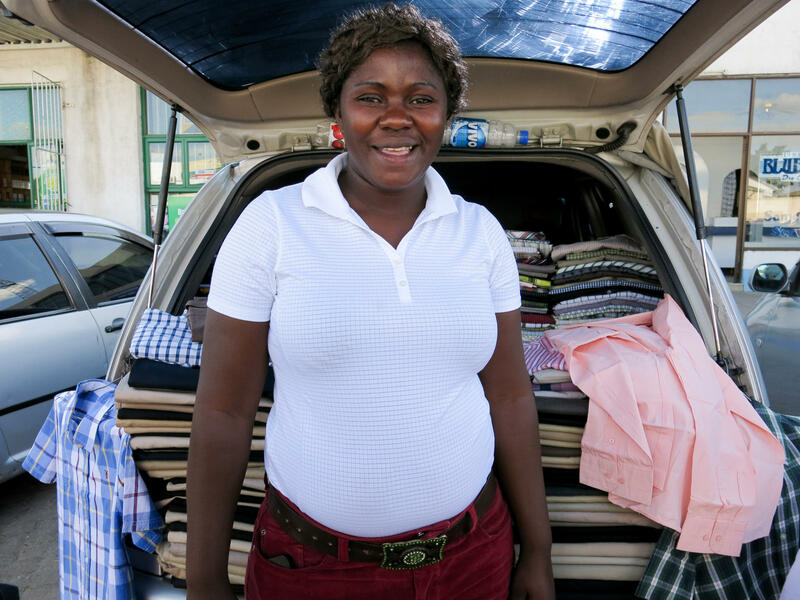 Naomi Mutonodza has come back to Nyakupinda's car trunk-store to change a pair of trousers she bought for her husband that didn't fit. "Yes, I'm a customer here, because you know what, I'm very comfortable to come here and buy here," Mutonodza says, "because the people here, the salesladies here, they're very cheerful. Very cheerful, nice girls here. This is my place." Mutunodza says the practice of buying from the back of a vendor's car started "because the prices are very comfortable. And very nice things — good trousers and good shirts, yah. Good quality yes. Yah. Very satisfied. Very satisfied. Thank you." Eyes twinkling, Fortunate Nyakupinda smiles broadly as she listens to another happy customer. Last month, Zimbabwe's information minister tweeted what he called a triple challenge. He wrote, we have workers without work; we've lost the sense of labor value; and we lack a strategy to create wealth. NPR's Ofeibea Quist-Arcton explored that bleak assessment through the eyes of a secondhand clothing vendor. OFEIBEA QUIST-ARCTON, BYLINE: I'm in the area of downtown Harare that's known as Copacabana, and people are eking out a living literally on the sidewalks. They're selling everything you can imagine, from piles of tomatoes to sugarcane to used clothes and shoes which are laid out on the sidewalks. Zimbabweans sigh. They lament that life is tough and everything is expensive in their U.S.-dollar economy. Fortunate Nyakupinda's livelihood fills and covers her parked hatchback. She sells used clothing from the car. And the first thing that strikes you is her big smile and a big laugh. FORTUNATE NYAKUPINDA: (Laughter). I'm earning a living. A little bit, yes. We get profit - a little bit profit, yeah, so I can pay my rent. I can even buy food for my kids, and I can even pay $5 for fuel to juice my car. QUIST-ARCTON: Nyakupinda, a 30-year-old mother of two, is clearly a born businesswoman. NYAKUPINDA: No, no, no, no, talk to my customer, this one, this one big - a big man. UNIDENTIFIED MAN: I'm a 34. UNIDENTIFIED MAN: Next, definitely, I'll buy from you. You'll remember me, I guess. NYAKUPINDA: Oh, I won't forget. This one - these plain shirts. Those ones - they go to church, they need their plain clothes. Yeah, and these checked - checked is for the farmers. And those ones, they go to work, they need the checked ones, yes. Everyone, every man can come and buy, so it's - you can see stylish, designs. Even - you can see this one. This one's an African attire. QUIST-ARCTON: It's a way to earn money with high unemployment and a stuttering economy, says Nyakupinda. She specializes in men's clothes because she says women are too fussy and always haggle over prices. NYAKUPINDA: They like clothes, but they are stingy. (Laughter). They are stingy. QUIST-ARCTON: So you're saying the women are stingy with their money? NYAKUPINDA: Yes, yes, yes, yes. They complain too much. QUIST-ARCTON: Fortunate Nyakupinda buys her used clothes by the bale from dealers in neighboring Mozambique for about $250 per bale. New clothes are pricey, and many Zimbabweans can't afford them in a country that used to produce quality cotton. NYAKUPINDA: We find that if we sell these clothes at a very cheap price, these people, they will come and buy. It's affordable, and they are cheap. QUIST-ARCTON: Zimbabwe jettisoned its own currency after the economic crash in the past decade. Today, the country relies on the U.S. dollar. Nyakupinda says life is expensive and money for a family just disappears. NYAKUPINDA: Every day, you need $20 every day so that you can survive in Zimbabwe. If you don't have $20 - like you need bread. You need sugar for the tea. You need mealie meal, so it's hard. QUIST-ARCTON: So, says Nyakupinda, her focus is firmly on selling and trying to boost your business. NYAKUPINDA: I am doing good business, but it's now very tough. Yeah, I'm proud of myself. QUIST-ARCTON: As we are chatting, business is brisk. Mutonodza has come back to Nyakupinda's car trunk-store to change a pair of trousers she bought for her husband that don't fit. MUTONODZA: Good trousers, good shears and good qualities. QUIST-ARCTON: So are you a satisfied customer? QUIST-ARCTON: Eyes twinkling, Fortunate Nyakupinda smiles broadly as she listens to another satisfied customer. Ofeibea Quist-Arcton, NPR News, Harare. Transcript provided by NPR, Copyright NPR.